I’ve been so excited to share this blog post with you. Now that November holidays have passed and we’ve had our first snowfall it has never been more of an appropriate time. 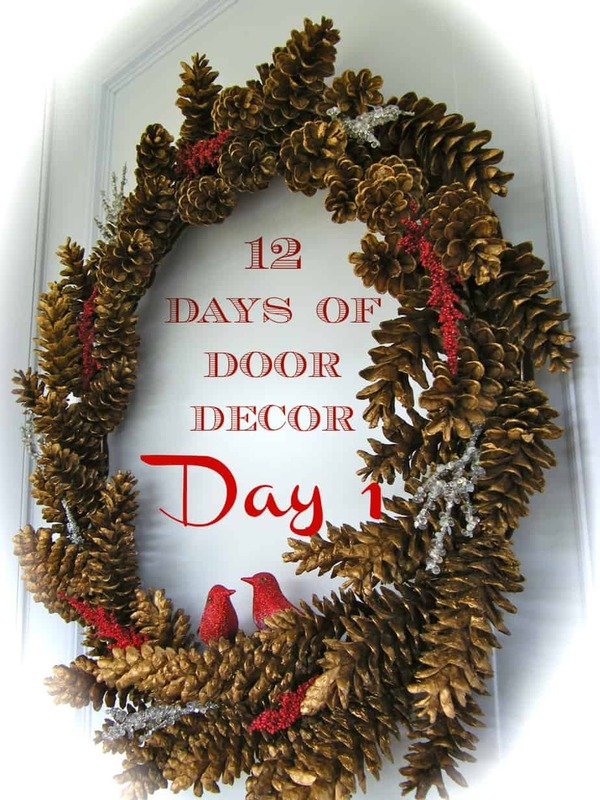 For the next 12 days I will be sharing a new door decor item. Most are wreaths but I have a few other tricks up my sleeve too. All of the Door Decorations have been made by yours truly, some ideas have been gathered from Pinterest, but all have changes that are sure to please. Please follow along to be sure you don’t miss even one… you won’t be disappointed. Enough chatter, lets get to it! 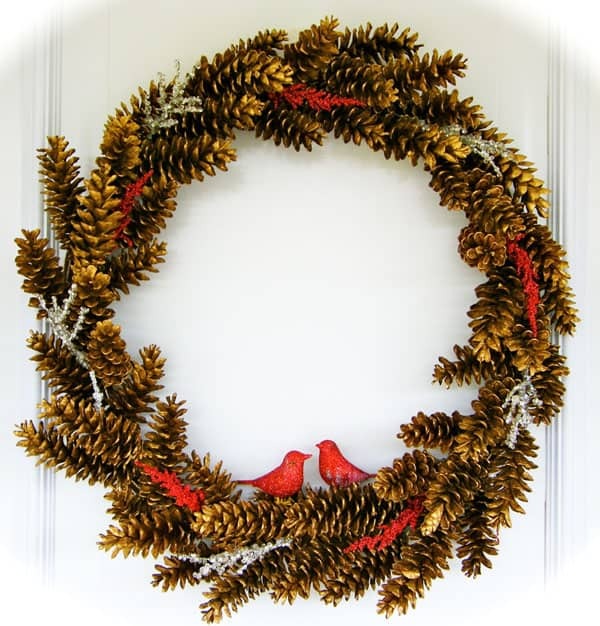 Today on the door I have for you a Golden Pinecone Wreath. This wreath was constructed on a standard 18″ wreath wire which comes in at .75 cents!! I collected pinecones and when they dried (I place mine by the fire, but you can use the oven method too) I spray painted them with metallic spray paint. Each Pinecone has a length of low gauge wire wrapped around the end, and secured to the wire frame. 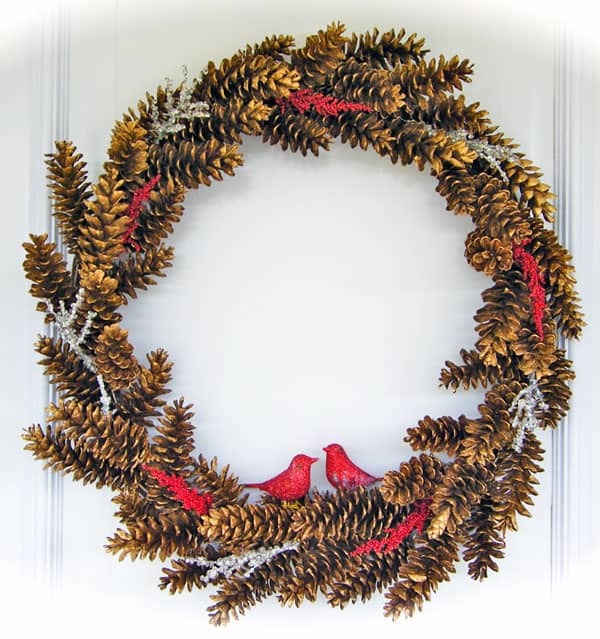 Work your pine cones in a circular pattern, when full as desired, add rouge/icy wreath pics and glittered birds to complete the look! If you live in an area where they make traditional wreaths with boughs, this is by far the cheapest option, you can pick them up at a Logging/Christmas tree supply shop (In the Annapolis Valley, Sanders Supply Shop in New Ross is your best bet). When the wreath is complete put a blob of hot glue on the wire to secure it in place and cover the wire in the back with a strip of felt as to not scratch the door. I hope you enjoyed this wreath, be sure to stop by tomorrow to see Day #2- Burlap and Bells. AAAAAHHHHHH, I won??!! Oh my gosh, I hardley ever win anything!! I am so pumped, Thank you Virginia. Yes! 12 days of inspirational Christmas decor. I’m sold. Can’t wait to see it all! ← ADVENT time is nearly here!! !